Our office is located at 9581 Shore Drive in the Pelican's Landing building across the street from the ocean. The office is open from 8:30 a.m. to 5:00 p.m., Monday through Saturday during peak season and from 8:30 a.m. to 4:30 p.m. during the off-season. On Sundays, the office is open until 1:00 p.m. during the season and is closed in the off season. Not all properties require an office check-in. Those in Ocean Lakes, Mar Vista, Anchorage, Bluewater and Sand Dunes can go directly to the locations. Do you allow motorcycles and their trailers? With the new laws concerning motorcycles, many complexes are not allowing trailers or bikes. Before booking, we suggest you ask your reservationist which ones will allow them. All of our condos are family friendly and provide all the conveniences of home. Make sure to call ahead if you have specific needs, and we'll do our best to meet them. Checklist: What should I bring? In terms of linens, the choice is yours. You can bring your own, or we'll provide them for an additional fee. Several of our units now include linens, however others, in order to offer reduced prices for the more budget conscious, do not. Keep in mind, you'll still need to bring beach towels from home or visit one of the beachwear stores to pick up a few. Our kitchens come fully equipped with dishes, cooking utensils, pots, pans and dishwashing detergent. Soap and one roll of bathroom tissue for each bath is also provided. How do housekeeping services work ? Guests will be responsible for paying a one-time departure cleaning fee with each stay. Departure cleaning varies in price relative to the unit size. You can purchase additional housekeeping services such as daily maid service or a mid-week cleaning. Inform your reservation agent if you would like to purchase additional housekeeping services. Myrtle Beach offers more than just relaxing on the beach and great golf. You'll definitely want to check out exciting attractions such as Ripley's® Aquarium, Hollywood Wax Museum, Broadway Grand Prix Family Race Park, Myrtle Waves Water Park, WonderWorks, Alligator Adventure, Pirates Voyage Dinner Show, Medieval Times, Carolina Opry and Alabama Theatre. If you love to shop, you've chosen the perfect vacation destination. You'll want to visit Barefoot Landing, The Market Common, Myrtle Beach Mall, Tanger Outlets, Broadway at the Beach, and Coastal Grand Mall. And, there are countless unique shops all in between. Plan to visit the charming towns of Conway just to our west and Pawleys Island to our south. You won't be disappointed you did. Can you help if we have needs for our baby while on vacation? Baby's Away is a wonderful local company that rents accessories for children and beach equipment for parents. Cribs, strollers, portable cribs, car seats, high chairs, toys, swings, excer-saucers and beach equipment. Call ahead to ensure availability: (866) 411-5895 or (843) 237-5257. The minimum rental age is 25 years old. At least one person in the party must be 25 years old and be responsible for younger travelers. Parents may not book condos and send their underage children in their place. ID's will be required at check-in. Sorry, no pets are allowed in any of our condominiums. 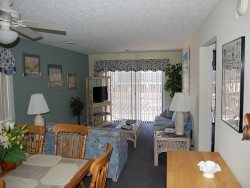 Ocean Lakes have some homes that all pets at a fee to stay. A $250.00 cleaning fee will be charged if a pet is found to have been in one of our units. Exceptions will only be made for registered service animals. If you require a service animal, it is important you notify us in advance. For the comfort of future guests and at the request of our condo owners, all of our Condominiums and Homes are designated smoke-free. In some units equipped with balconies, smoking is permitted outside only. An additional cleaning fee of $250.00 will be charged if smoking has occurred inside any unit. Is parking included free of charge? There are two parking spaces allocated to each unit and available to you free of charge. There is no additional on-site parking. Ocean Lakes requires a fee for all vehicles that visit the grounds the fee is 10.00 per day per vehicle. That chage can be added to your reservation as a convenience.